Insulation is one of the most cost-effective ways to make your home more comfortable and lower your heating and cooling bills. 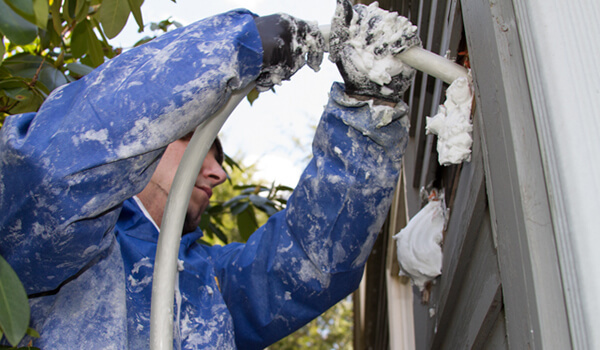 As the authorized Dr. Energy Saver dealer in D.C. & MD, Complete Home Solutions offers a variety of exclusive insulation products and all of our technicians are fully trained to ensure quality installation. Think you might need more insulation in your home? Call us at 1-855-247-9984 or click below to schedule your free estimate in Annapolis, Glen Burnie, Pasadena or another surrounding area in Maryland. This home in Rockville, MD had open insulation in the attic that was causing drafts and uncomfortable temperatures in the home. The homeowner called Complete Home Solutions to find a solution to the problems. Our Auditor found the problems to be insufficient insulation and air leaks in the attic. Our Production Team insulated and air sealed the exposed insulation and pipes to make the home more energy efficient and comfortable. This homeowner was concerned about the insulation in their crawl space. It was absorbing ground moisture, causing it to sag and deteriorate. It also was allowing possible orgnaic growth issues and their floors above were uncomfortable. Complete Home Solutions removed the damaged existing insulation. We then completed an crawl space encapsulation with SilverGlo board. Dimpled drainage matting was installed across dirt floor area, SilverGlo board was installed on the walls and the 20 mil Cleanspace liner was installed over the dimpled drainage matting. The CleanSpace Encapsulation allowed us to create a clean enviroment in the crawl space and the result was increased comfort to the floor areas above. This homeowner now does not have to wear socks to keep their feet warm. Looking at the picture on the left, we have three main problems with this attic (two you can see, one you can't). One, there's not enough insulation. The yellow BATT insulation (featured on the left) is barely to the top of the floor joists (meaning there should be at least 6" more). Two, there is no air sealing (this you can't see). We need to get underneath the insulation to fix this. Third, the whole house fan is completely out in the open (acting as a major source for unwanted air leakage). To fix the air leakage, CHS pushed aside the old insulation and caulked any penetrations that were facilitating this issue. To bring insulation up to the BPI recommended standard, we blew in closed cell cellulose insulation. To stop the outdated whole house fan from leaking air, we constructed a 2x4 frame with a hinged top (insulated with 2" of foam board) and installed a string and pulley to allow for easy opening. This homeowner in Takoma Park, Maryland was suffering from terrible cold drafts and ridiculous high energy bills. He knew that winter was coming on fast and that he would need a solution to his problem. He also knew that Complete Home Solutions had a team of experts that was ready to take on this project. An energy audit lead us to the conclusion that this home's attic was the main perpetrator in the homeowner's discomfort. What could we do to fix that? Well, we air sealed the attic, filled it with some cellulose insulation, and installed a “magnet whole house fan cover.” That last upgrade is what you see here in this “after” picture. The house fan is an important final touch that stops your warm air from leaking out of the vent creases in the winter time (saving you a lot of energy). Thanks to Complete Home Solutions, this homeowner is now living comfortably. This customer of ours was a brand new homeowner - he had just purchased his house about a month before contacting us. Of course he had a home inspector check the house out and make sure that everything was squared away. One thing that the inspector found was that there was insufficient insulation and air sealing. He wanted to hire a reliable company to fix this for them. He hired Complete Home Solutions to take care of his new home! As a part of our solution for him, we air sealed the attic and applied fresh cellulose insulation. The customer also had a specific request for ventilation - he wanted a solar powered attic fan. We were more than happy to oblige and had that installed as well. He can now expect to move into a comfortable home at an affordable cost. This homeowner purchased a home in Hyattsville, MD that was built in 1950. The home was in need of many energy efficient upgrades. Our home comfort specialist, Merv Roussell, performed a home energy audit and recommended a number of improvements. We ran a blower door test and found that the home was 1.96 leaker than a home its size should be. Part of the air leakage came from the attic where there were multiple problems: the home had attic flooring which made it difficult to air seal the penetrations and there was insufficient insulation levels through the attic. We removed the attic flooring, air sealed all the pentrations to stop the excessive air leake. We installed TruSoft cellulose insulation to bring the insulation levels up to R-49 as recommended for our climate zone. 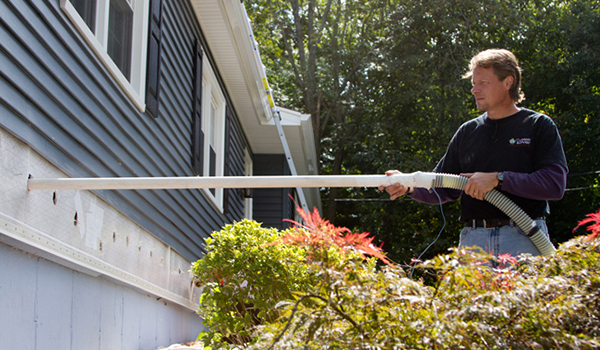 These homeowners have moved into the home and are feeling the benefits of these improvements. The homeowner of this house in Hyattsville, Maryland suffered from high energy bills and uncomfortable temperatures in their home. They called Complete Home Solutions to find the source of the problem. Our Auditor determined that the source of the issue was insufficient attic insulation. 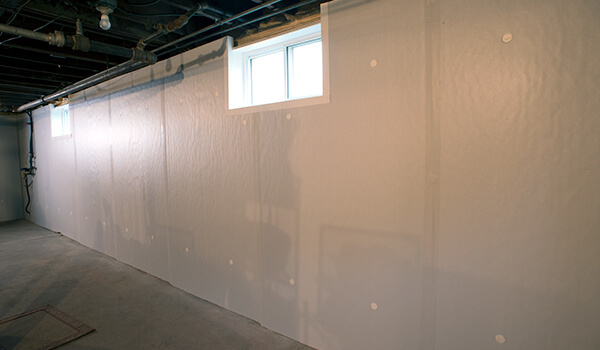 Our Production Team installed blown-in cellulose insulation to make the home more energy efficient and more comfortable. This homeowner in Hyattsville, Maryland seemed to spend every winter exasperating themselves trying to stay warm. They decided that they had had enough this winter! They got into contact with Complete Home Solutions. The first step we took was to perform a Home Energy Audit and figure out what we were dealing with. We found that the attic was a major part of the problem. There was an absolute minimum amount of insulation and no air sealing. All that hot air that the homeowner was trying to fill the house with was slipping right up and out through the attic! After explaining this to them, they had us seal up the attic hatch, air seal the rim joists and any attic penetrations, and install TruSoft Cellulose insulation to fix the problem. The homeowner has already noticed a difference in their comfort levels and is no longer dreading the long winter! When you schedule an in-home consultation with us, we'll ask you questions about your home, discuss your goals and determine the right insulation services and upgrades for your home. Proper attic insulation is crucial. Choose from cellulose, spray foam or radiant barrier insulation. 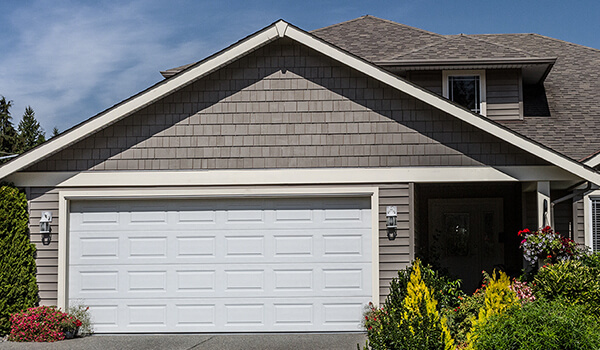 Adding insulation in the garage can make the both garage and the room over your garage warmer. 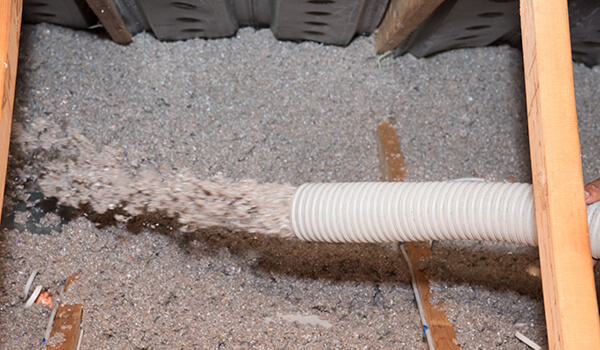 Learn more about the benefits of our complete system for sealing and insulating a crawl space. Lower your overall heating costs and create a dry, comfortable living area in your basement. 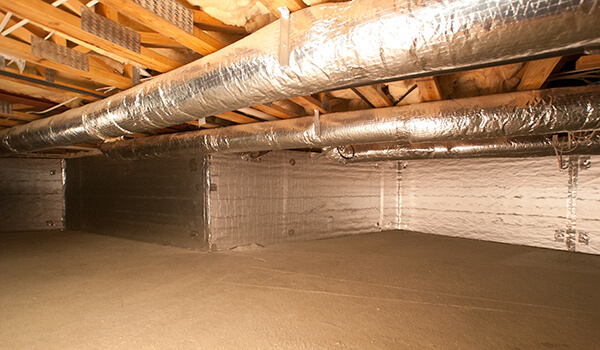 Learn how we can insulate floors over a garage or crawl space to make rooms more comfortable. 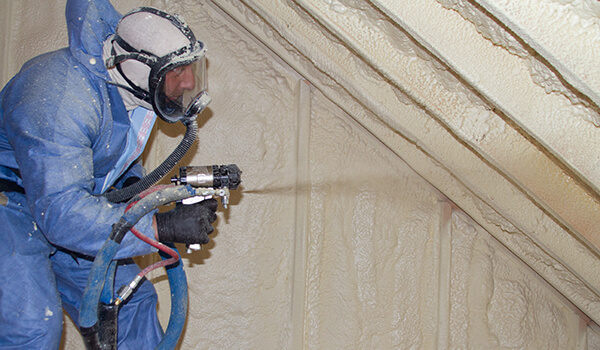 Spray foam is a versatile insulation option and a superior alternative to fiberglass insulation. 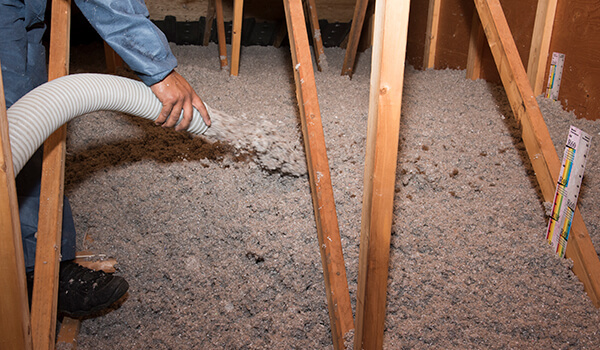 We install blown, loose-fill and dense-packing cellulose insulation for attics, walls, ceilings and more. 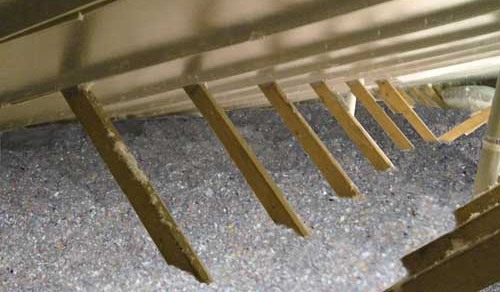 Blown-in cellulose is ideal for insulating attics, wall cavities and odd-shaped areas. 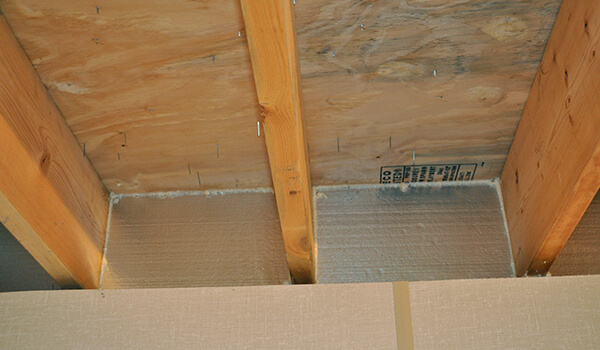 Rigid foam is ideal for insulating the attic ceiling, basement walls and crawl space walls. Most insulation works by resisting the flow of heat. Heat flows naturally from warmer to cooler. This is the reason why heat from inside the home flows outward in the winter and heat from outside flows inward in the summer. Insulation works to slow this process, so your heating and cooling systems don't need to work as hard to maintain a comfortable temperature inside your home. Adding insulation and sealing air leaks can give you a healthier, more comfortable home and make a real difference on your utility bills. How well insulation is able to resist heat flow is identified by R-value ("R" stands for resistance). The higher the R-value, the better the insulating power. The amount of insulation that you need depends on the type of insulation, the climate and how old your home is. Complete Home Solutions is a professional insulation contractor, so we install many types of insulation. We also perform air sealing services; saving you the hassle of having to find another contractor to do the job. Do you have rooms that are too cold in the winter or too hot in the summer? Do you have rising heating and cooling bills? All of these problems can be caused by not having enough insulation in your home. Contact us today for a free estimate on air sealing and insulation services. We are the trusted insulation contractor in Rockville, Annapolis, Bowie, Bethesda, Upper Marlboro, Waldorf, Laurel and surrounding areas.